Since the dawn of the iPad, we’ve gone from wondering if we’d ever DJ with it, to reluctantly trying to DJ with it, to happily DJing with it as a compromise in certain situations. With the new Reloop Beatpad 2 combined with Algoriddim Djay 2, could the day of no-compromise iPad DJing finally be upon us? Join us for our in-depth examination. System Requirements: Mac: OS 10.9+ for use with Algoriddim Djay Pro. PC: Windows XP/Vista/7. iOS: Djay 2, iOS7+, iPad gen 4+ (with Lightning connection. Android: Android 5.0, Djay app. The Good: 16 excellent RGB performance pads control 8 diverse performance modes. Tightly integrated with Djay for iOS, Mac and Android/Kindle Fire. Very sturdy construction. High-quality components and audio. Key Match function for harmonic mixing. Spotify Premium integration through Djay software. The Bad: Surface area for large jog wheels and mobile device stand takes away from dedicated effects controls and filter knobs. Not compatible with other iOS DJ apps. Loop size maxes out at 8 bars (for now; a future update supposedly will increase to 32 bars). On the expensive side for an Algoriddim Djay controller. The Bottom Line: With the Beatpad 2 and Djay 2 app, you have a high-quality all-in-one DJ controller with a sophisticated software. Several years ago, it would have everything you could want for digital DJing. Technology has progressed since then, but this is still a solid professional option for 2-deck DJing from a very compact setup. We have so many wonderful evolving configurations of DJ gear to choose from because today’s DJs can’t be neatly summed up with a single job description, style, or set up. At the risk of committing a sweeping generalization, it’s here. Legit DJing from an iPad (and to a lesser extent, iPhones and Android devices) is here. It’s already been here for people using Traktor DJ and other combinations of app and controllers, and for some DJs, iPad DJing will never be sufficient. However, we’re getting ever closer to a time when a DJ’s choice of an iPad will be just as mundane as their choice of a laptop, USB sticks, or vinyl. The Beatpad 2 is co-branded with Algroriddim, and it unlocks advanced features in the Djay 2 app for iOS – as well as the Djay app for Android/Kindle Fire – that no other controller does right now, such as the Slicer and Slice Loop modes. It’s also tightly integrated with Djay Pro for Mac and works as a standard MIDI controller for PC/Mac apps. There are currently mappings available from Reloop for Traktor Pro 2 and Virtual DJ. Like the original Beatpad, the Beatpad 2 falls into Reloop’s camp of solidly built all-in-one controllers, with an all-metal chassis, chunky encoders, high-end and responsive pads and just in general, confidence-inspiring components. The replaceable crossfader has the kind of controlled looseness meant for scratching, and the large jog wheels have an LED ring to show playhead position for scratch DJs. The jog wheels’ outer edges are touch-sensitive for slight nudging or rapid track seeking when used with the Shift key. No complaints about the jog wheels construction or responsiveness, but making them smaller arguably could have made room for some missing controls while taking little away from their utility. Although the controller makes good use of the Shift buttons to double up the functionality of controls, space on the Beatpad 2’s surface is at a premium because of the mobile device holder at the top where traditionally effects controls are located. The holder is well sized for a 10-inch iPad, and will also work for iPad minis, large smartphones and most Android tablets. While the mobile device stand takes up space that could be used for other things, it is convenient; it places your touchscreen device within easy reach, and centering your gaze on the instrument and screen more tightly than traditional laptop DJ setups. Djay 2’s evolving capabilities allow the Beatpad 2 to compete with high-end Serato controllers with its 16 RGB performance pads and eight performance modes. While many DJs prefer these pads to be located at the front of the surface, like on Pioneer and Numark Serato controllers, the Beatpad 2’s performance modes and pads are excellent. They anchor the unit in the modern age of digital DJing and are the biggest reason why DJing with this iOS software/hardware setup feels like less of a compromise than ever. Filter EQ is nice, but with a little more space, there could just be a dedicated Filter knob along with 3-band EQ and skip the switching of modes. The Beatpad 2 requires the AC adapter to power on (USB power is insufficient), but the upside is that with all that power, there’s plenty of dBs from both the headphone outputs and the main outputs, and it also charges connected mobile devices (you won’t run out of tablet power during a gig). 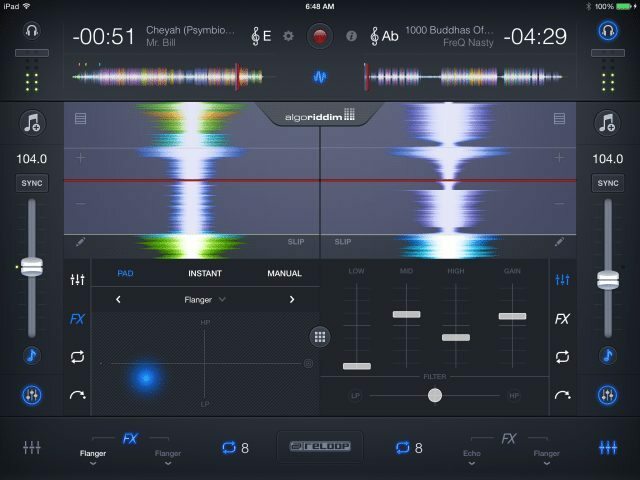 While Beatpad 2 works well with desktop software, it’s designed for the mobile Djay apps, and it doesn’t make much sense unless you’re going to use it with some kind of mobile device. We tested it with Djay 2 on an iPad Air 2, and it was a real treat to play. With double the number of performance pads as the original Beatpad, more performance modes and the updated Djay app, this is a really attractive portable option for digital DJs practicing 2-deck mixing. After connecting the iPad and opening Djay 2, the app recognized the Beatpad 2 immediately and opened a special Reloop skin. The hardware track browsing controls let you jump right into either your device’s music library or your Spotify Premium account and load tracks. Every function on the Beatpad 2 works with Djay 2, so there’s no mystery to it. Besides the added and welcome ability to control the app from the touchscreen, the experience feels very much like 2-deck mixing from desktop software. The performance pads are the highlight of this setup. Four performance mode buttons select the eight modes; pressing the mode button twice accesses the secondary layer. Right off the bat, it’s great to have eight cue points at your fingertips. Another mode plays back Djay 2’s sample slots (six per deck), which you can replace with other samples on your device. Auto Loop and Bounce Loop both create loops of eight different lengths according to the pad you use. Auto Loop continues the loop until you hit one of the pads again, while Bounce Loop only loops while you hold down the pad, and it works in Slip mode, so the audio continues its original playback position when you’re finished looping. Touch FX mode assigns preset effect combinations to each of the eight pads. Timed filter and flange effects, bit crushing, stutter delays and reverse effects make up the palette. The companion Jog FX mode makes up for a lack of dedicated effects controls by making the jog wheel with its LED ring an effects amount knob for the two effects slots in each Djay 2 deck. This is a nice touch, but it only uses two of the eight performance pads in each deck. It would be even nicer if the Jog FX mode would let you select up to eight effects slots per deck from the eight performance pads, but that would probably require a software update to Djay 2. Finally, Slicer and Slice Loop modes are closely related. They both essentially divide the playing track into eight segments of one count each, and you can jump around those segments in time by playing the pads for some live remix action. Slicer mode simply jumps to a segment as you hit a pad; Slice Loop jumps to a segment and loops it for as long as you hold the pad. It helps too that the pads both feel and play incredibly. We’ve encountered pads that verge on too hard or too squishy. The pads here seem to find the perfect medium, and they respond very evenly across the whole surface. It’s a pleasure to play cue points, slices, and samples on them with precision. For fans of harmonic mixing, Djay 2 adds a Key Match function, along with the normal Key Lock, where the app pitches the upcoming song up or down to match the key of the current song. Each deck of the Beatpad 2 has a shortcut button to turn on Key Match. Technically, this feature works very well. The key correction sounds accurate, and the corrections aren’t drastic enough to cause artifacts in the audio. They can, however, cause some double-takes when you hear a familiar track being pitched several keys up or down. It’s fun to play around with and to use judiciously, but it’s a matter of personal preference when the key correction makes a melody sound like it’s being played underwater or turns a lovely female vocal into a bullfrog undergoing puberty. What Makes a Djay Pro? The Beatpad 2 is also a great controller for the evolving Djay Pro Mac software, which now has four decks of mixing, video mixing, the aforementioned Key Match function and other next-level features that make it a very intriguing proposition for $50. Still, the Beatpad 2 feels primarily like a controller made for mobile devices that can also work on a Mac when you need it. 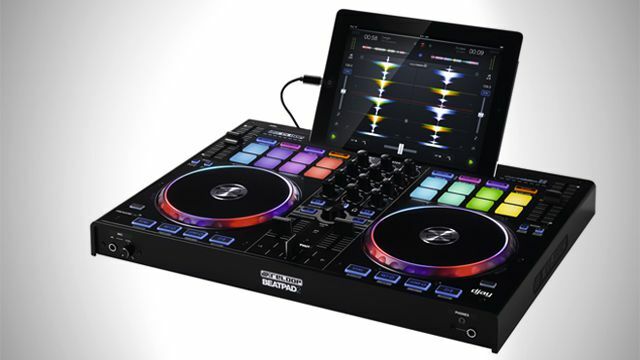 Let’s be real: if you’re going to spend $699 on a DJ controller and you’re not going to use it with a tablet or smartphone, are you really going to buy the one with a tablet stand built into it? Nah, man. So do you want to be an iPad (or Android) DJ? In this age of Stems, 4+ deck mixing, and controllerism toeing the line between DJing and live performance, it may be that DJing from mobile devices will be playing catch up with other systems for a long time. But in the right hands and with the right preparation, the results you can get from the Beatpad 2 with Djay 2 are professional level in the here and now. Depending on the jobs you do, tasteful 2-deck mixing of winning tracks may be exactly what you need and preferable to any other show-DJ histrionics. If that’s the case, the new 16-pad layout and new performance modes of the Beatpad 2 along with the scrolling waveforms and samples of Djay 2 make it feel very much like a Serato experience, except in a more portable, less expensive package. If all that is not enough for you, just stick around. Mobile device DJing is far from finished. Markkus Rovito is a regular contributor to DJ Techtools – if you have any questions about the Beatpad 2, let us know in the comments and we’ll answer them.